Why did so many people come from so far away to study with Claude Gordon? What made him unique? Why do so many people owe their careers to this man’s teaching? In this article two of the seven fundamental physical items of Brass Playing are going to be explained. This article is meant to accompany the article How To Practice. The article What To Practice also explains how to apply all the Seven Basic Items in a daily practice routine using the various known method books. In 1912 Herbert L. Clarke wrote one of the mostly widely used trumpet method books. It is still in use today by every serious professional and aspiring professional trumpet and brass player. The size of the book, 53 pages, is far outweighed by the volume of wisdom contained in just a few brief comments on how to use the book. This book however, like many books, has been subjected to reinterpretation. In the early 1980s the book was reprinted with translations into three languages (English, German, and French). At that time the English text was changed, possibly for easier translation. The following is intended to show how to apply all the information covered in the first article entitled How To Practice. Since playing a brass instrument is a physical experience it is impossible for anyone to completely learn and understand the first article on the seven items until they have experienced them through daily structured practice. There will be those who “try” some things and then say that it does not work for them. The truth of the matter is that they never understood what they were “trying” to do. How often have you heard that someone is a great instrumentalist because they are a “natural” and that “naturals” are rare? That is not true! Playing a brass instrument is easy if done correctly. Watch the best players and notice how easy they make it seem. By contrast, watch the many high school and college students turning red trying to play high notes. They try every gimmick known hoping they will discover “the secret.” They waste money and time on mouthpieces, instruments and other equipment. I first met Claude in the summer of 1984 at his CG Brass Camp. I was immediately struck by his encouraging and positive attitude. He believed anyone could become a great player and accomplish what others said were only for a gifted few. He showed how all the great players played the same way in regards to fundamentals (i.e. defined as The Seven Basic Items) and that it could done by anyone. I began private lessons with him on July 24, 1984 at age 16. 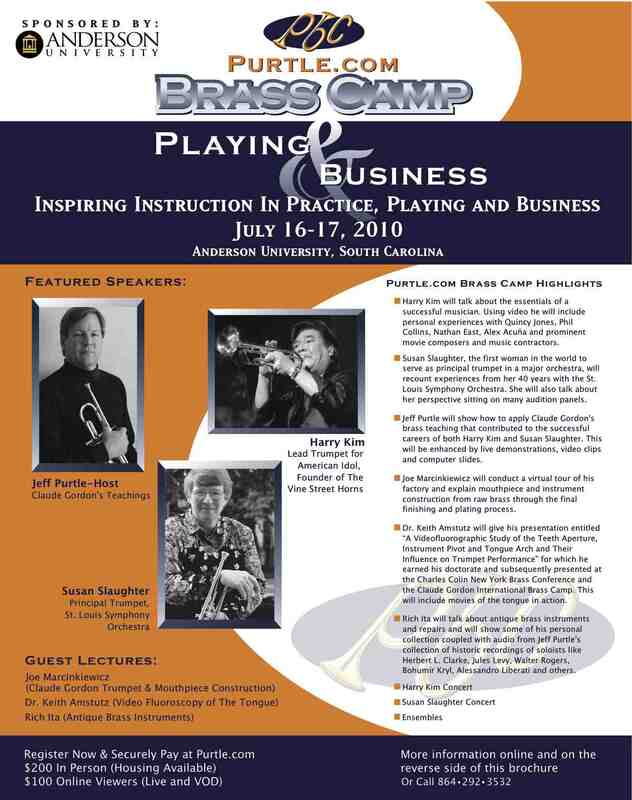 I studied consistently over the next ten years and eventually became one of the staff at the CG Brass Camp.